Lenovo is apparently preparing a big announcement for its ThinkPad laptop line, a completely new model to compete with Dells XPS 15. The new ThinkPad X1 Extreme was leaked by known leaker Roland Quandt and it might be released at IFA 2018. Lenovo ThinkPads are known to be quality business-laptops with a wide variety of different models to choose from. But in the past years, there has been a hole in Lenovo's lineup: Lenovo didn't produce a competitor to Dell's successful XPS 15 – a thinner and lighter 15-inch ThinkPad with great performance. Apparently, Lenovo wants to close this gap soon. Roland Quandt is a known tech-journalist from Germany, who often leaks new products. 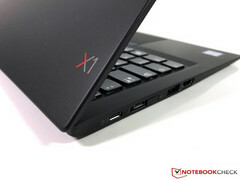 Today, he published an article that details a completely new Lenovo ThinkPad: The ThinkPad X1 Extreme. Unfortunately, there are no pictures of this new high-end laptop yet. But Roland Quandt has published the core specifications of the device (of course, we can't vouch for the accurateness at this point): The ThinkPad X1 Extreme will be a 15.6-inch laptop with a thin & light chassis made out of Carbon fiber – its design is said to closely resemble that of the smaller ThinkPad X1 Carbon. Lenovo uses the roomier chassis to put in much more powerful components: Instead of low-power Ultrabook CPUs like the Carbon, the X1 Extreme will utilize the newest Coffee-Lake CPUs like the Intel Core i5-8300H or the six-core processor Intel Core i7-8750H. Not only that, the ThinkPad X1 Extreme will also optionally feature the Nvidia GeForce 1050 Ti – although its unclear if its the normal version or the MaxQ version of this chip. Adding to that, the new ThinkPad will feature up to 32 GB of RAM and 1 TB of NVMe-SSD-storage. There will be two display options, with a Full-HD (1,920 x 1,080) as the base option and a 4K-display (3,840 x 2,160) as an upgrade. With these specifications, Lenovo seemingly sets up the ThinkPad X1 Extreme as a direct competitor to the Dell XPS 15 and the Apple MacBook Pro 15. According to Quandt, it will also be priced accordingly, with prices in Europe starting slightly below 2,000 Euro for the base config and over 4,000 for the most expensive model. Quandt did not leak a announcement date, although he does suggest that an announcement at IFA 2018 in early September is likely. Not long ago, a picture of another upcoming ThinkPad surfaced, which is called the ThinkPad P1. This unit seemingly also competes with the Dell XPS 15 – at this point, we don't know if there is any connection between the ThinkPad P1 and the ThinkPad X1 Extreme.